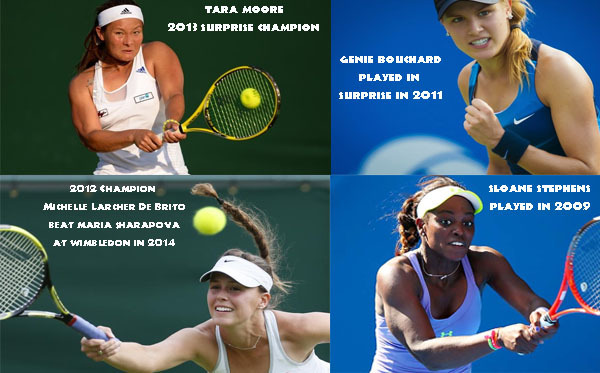 Many of the best up-and-coming young women's professional tennis players in the world will be in Surprise, Arizona, Feb. 17-23 for the 2014 Surprise Tennis Classic, a $25K stop on the USTA Women's Pro Circuit. Professionals just outside the top 100 WTA Tour world rankings will be vying for $25,000 in prize money and valuable rankings points in this, the now seventh consecutive year the tournament has been held at the award-winning Surprise Tennis & Racquet Complex. Past alumni of this tournament have included Yanina Wickmayer (US Open Semifinalist 2009 - played in 2009), Sloane Stephens (World. No. 12 - played in 2009) and Eugenie Bouchard (Australian Open 2014 semifinalist - played in 2011). Main draw matches begin singles main draw matches will begin Tuesday, Feb. 18, and doubles main draw matches begin on Wednesday, Feb. 19. The singles draw is a 32 field, while the doubles field round out at 16, with qualifying rounds starting a couple days prior to main draw beginning. The singles and doubles championship finals will be held, Sunday, Feb. 23. Celebrating its 34th anniversary, the USTA Pro Circuit serves as America's pathway to the U.S. Open and tour-level competition. USTA Pro Circuit graduates have accounted for more than 50 Grand Slam singles titles and, overall, 14 Pro Circuit veterans have risen to No. 1 in the world.